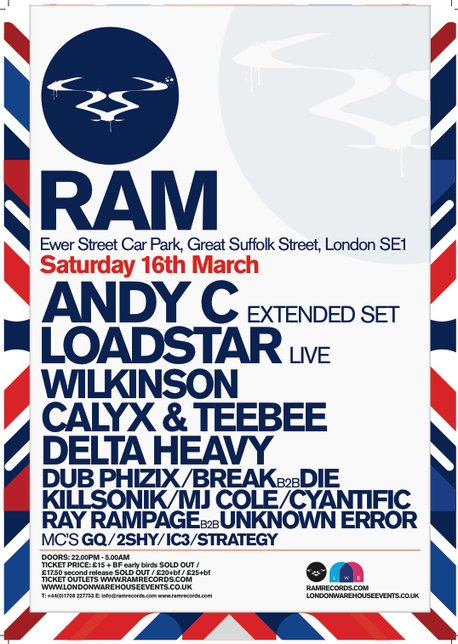 Award-winning bass music label, Ram Records, is staging its first warehouse party on Saturday 16th March at Ewer Street Car Park, one of London’s largest warehouse venues. Label founder, Andy C, will be appearing at the Great Suffolk Street venue for the first time and will perform one of his extended sets, with support from a host of label mates and handpicked guests performing across the venue’s arches. For this one-off event, Ram will be presenting a line-up including a live set from bass music duo, Loadstar, who will be performing tracks from their forthcoming debut album release, as well as Wilkinson, whose new single ‘Need To Know’, featuring Iman has been playlisted at Radio 1. Also on the bill are tech-step heroes Calyx & TeeBee and breaking act Delta Heavy, supported by Dub PhiZix, Break b2b Die, Killsonik, MJ Cole, Cyantific, Ray Rampage b2b Unknown Error with MCs GQ, 2Shy, and Strategy completing the line-up. Its like you read my mind! You appear to know so much about this, like you wrote the book in it or something. I think that you could do with a few pics to drive the message home a bit, but other than that, this is fantastic blog. A fantastic read. I'll certainly be back.